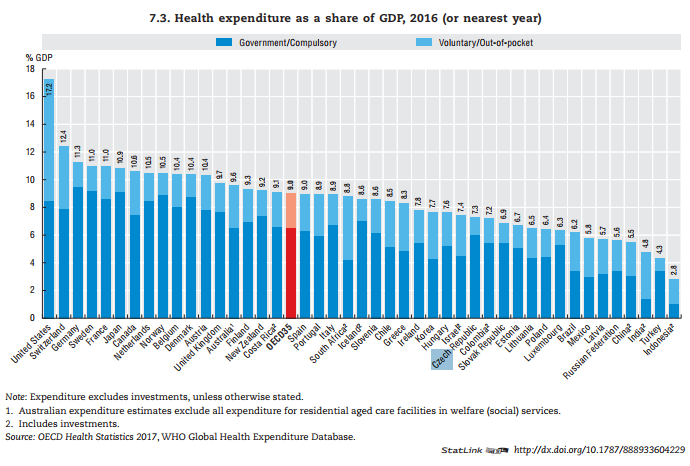 According to OECD Health at a Glance 2017 report, a similar sized group of mainly Central and Eastern European countries, such as Hungary, the Czech Republic and Poland allocate between 6-8% of their GDP to health. Since 1990, cerebrovascular disease mortality has decreased in all OECD countries, although to a lesser extent in Poland and the Slovak Republic. On average, the mortality burden from cerebrovascular disease has halved across OECD countries. In Estonia, Luxembourg, Portugal, the Czech Republic and Austria, the rates have been cut by over 70%. In most OECD countries, cancer-related mortality rates have fallen since 1990, with the largest reductions in the Czech Republic and Switzerland. 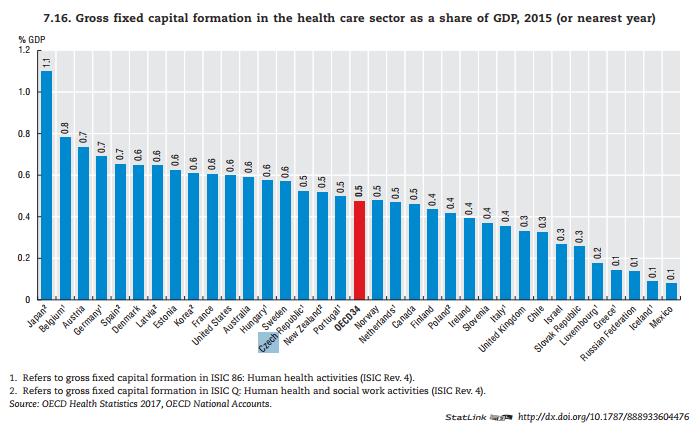 As for colorectal cancer, despite some progress, Central and Eastern European countries, particularly the Czech Republic, Slovenia and the Slovak Republic continue to have higher mortality rates than other OECD countries. People in Iceland or Ireland were close to three times more likely to report depression than people in the Czech Republic. These differences are in part driven by different attitudes and understandings around mental ill-health and depression (and related stigma). OECD data show that the Czech Republic ranks below OECD average in daily fruit and vegetable eating. Overall across the OECD, overweight increased by 28%, from 12% in 2001-02 to 16% in 2013-14. The strongest increases occurred in the Czech Republic, Israel, Latvia, Poland, the Slovak Republic and Sweden, where overweight rose by more than 50%, as well as Estonia and Lithuania and the Russian Federation, where they more than doubled. Overweight has dropped since 2001-02 in Denmark, as well as for boys in Iceland and Spain, and girls in Norway and the United Kingdom (England). 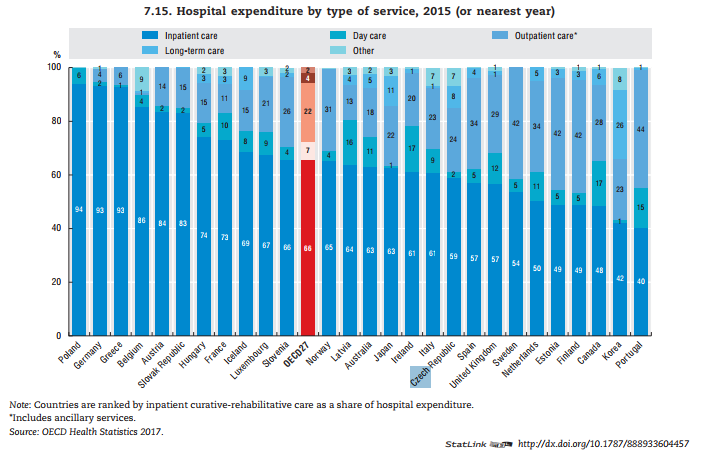 In some Central and Eastern European countries such as Poland, the Czech Republic and Hungary, as well as Canada and Mexico, expenditure on pharmaceuticals accounts for half or more of all out-of-pocket payments. This may be due not only to co-payments for prescribed pharmaceuticals, but also high levels of spending on over-the-counter medicines for self-medication. 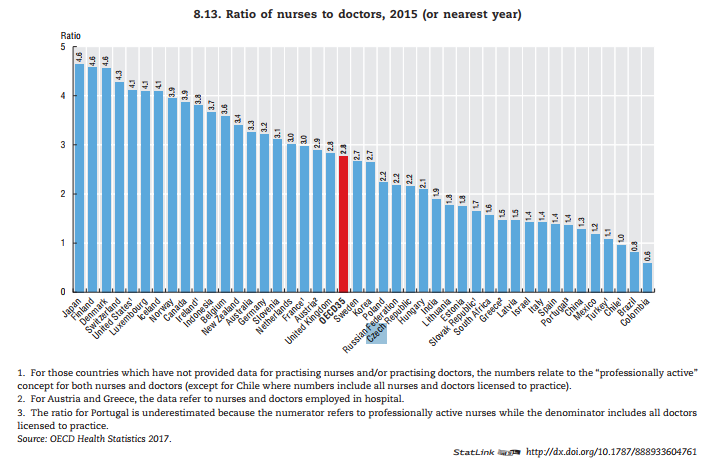 In many countries there is a high concentration of physicians in capital cities; this is particularly evident in Austria, the Czech Republic, Greece, Mexico, Portugal, the Slovak Republic, and the United States. Overall volume of antibiotics prescribed is below OECD average in the Czech Republic. There has also been a strong rise in the number of medical graduates in the Czech Republic and Poland. This increase since around 2009 can be explained partly by the growing number of international students choosing these countries to purse their medical studies. International students accounted for about 30% of all medical graduates in the Czech Republic in recent years. The internationalisation of medical education combined with migration makes it more challenging for national governments to set their own domestic policies. Invitation: Health Care 2.0: How To Manage Health Insurance Companies Effectively?